Faster, Gentler Seed Transfer with New Seed Pro® Tender Models - Unverferth Mfg. Unverferth Manufacturing Co., Inc. introduces two new Seed Pro® tender models for faster, gentler unloading. Models 410 and 210 Seed Pro bulk box carriers feature 4-box and 2-box capacities (200 and 100 seed units), respectively. The patented belt design features offset rows of integrally molded cupped cleats for faster, gentler seed transfer. The belts are manufactured with 5-ply rubber for long life and added durability. Both models feature a 6” x 18’ long conveyor with 8” belt for easily filling planters at speeds up to 18 bushels per minute. The model 410 can also be fitted with an 8” x 18’ conveyor and 12” belt for unloading speeds up to 35 bushels per minute. 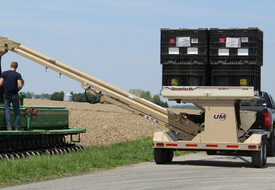 A model 410XL is equipped with an 8” x 21’ conveyor for the optimum combination of reach and unloading speed. The conveyor is powered by a reliable 390cc Honda® electric-start engine with controls conveniently located on the operating side of the unit. An electronic control module allows the user to adjust conveyor speed independently of the engine RPM and is conveniently located in the control box. Two downspouts are included for easily switching between filling planter boxes and central-fill planters -- a 4’ flexible and a two-stage. An optional three-stage downspout is also available for added unloading reach. The heavy-duty undercarriage features standard all-wheel electric brakes, highway-rated tires, transport chains, reflective striping, LED lighting – including clearance lights – for safer road travel. Both models are available with a bumper hitch and the 410 is available with a gooseneck hitch. All units feature two-part urethane coating in trademarked ivory and powder-coated tan. Weighing options include a traditional scale for both models and an enhanced scale package with auto-unloading capabilities for model 410. Wireless remote options include 2-function remote control for model 210, and 3- or 6-function wireless remotes for the 410. The available T&G applicator provides clean, accurate application of seed lubricants for enhanced planter performance. Additional options include a spare wheel and tire package, hydraulic jack and an L.E.D. work light kit with one conveyor-mounted light and two box-mounted lights.